More colour is being added to the remaining white walls at Echo Pool to help beautify the facility. The pool mural project that began last year is now in phase two with 17 new and colourful murals created by 16 artists being hung at the pool. The project is a partnership between the City of Port Alberni Parks, Recreation and Heritage department and the Community Arts Council. 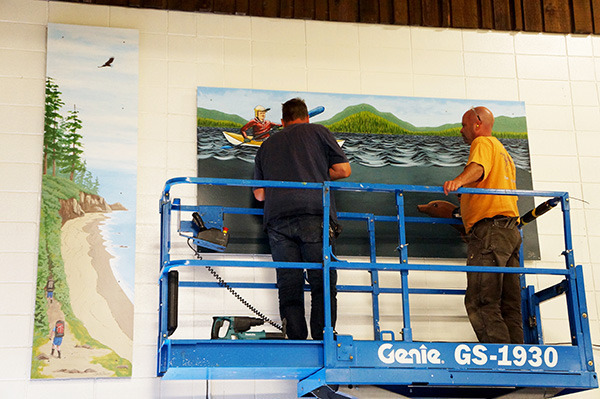 Last year’s murals are hung along the south wall of the pool and now with the addition of the 17 new paintings, almost the entire wall space will be covered with art. This initiative sprouted close to two years ago from a conversation between Melissa Martin, arts administrator at the Rollin Art Centre, and Karen Freethy, City of Port Alberni recreation programmer who both wanted to add colour and beauty to the pool. With help from Rob Kraneveldt, senior maintenance worker at Echo Centre, the three began working together to hunt down supplies and find artists. “Rob did all the legwork in terms of the materials and supplies, I handled the artist side of things and Karen sort of did the administrative side of things…so it was a collaborative event,” Martin said. Last year’s mural theme—west coast aquatic—carries on to this year with an additional component of healthy lifestyle elements. The murals are painted using standard house paint on aluminum composite panels rather then on the walls themselves so that one day if a new pool is built the murals can be moved. The aluminum panels are similar to the material used for outdoor signage like traffic signs that can withstand the high humidity and chemicals of the pool. The 16 artists vary in age, with the youngest just 10 years old. All were supplied with an aluminum panel and a pallet of 22 colours that depict the west coast. They each had six months to finish their murals. The 16 artists are Hanna Banks, Leanna Britton, Ava Carriere, Andrea Cole, Liisa Creiger, Sandra Dailey, Irene Dawes, Kristi Dobson, Diana Friesen, Payden Gaudreault, Al Laslo, Robert Liboiron, Shayne Lloyd, Melissa Martin, Shelley Penner and Ryan Price. The Community Arts Council and Port Alberni Parks, Recreation and Heritage Department give special thanks to Ladybird Engraving for supplying plaques. An official unveiling will take place at Echo Pool on Wednesday, Sept. 14 from 6:30- 8 p.m.
A free swim and activities will be available to everyone.